Can You Still Improve Your Vision Naturally After LASIK? You had LASIK, and your vision has started getting blurry again. Now you’re looking for some kind of natural solution to get that vision back that you just recently spent all that money for. Your LASIK surgeon promised you 20/20 vision, right? If you haven’t had LASIK yet, read this instead. You know LASIK is a pretty major procedure, even if they like to paint it as a routine thing that you shouldn’t even have to think about if you’re lucky enough that your eyes qualify. 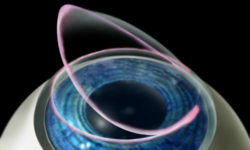 The question is: Are the methods we promote here safe for post-LASIK eyes? What Happens if you Relax Your Eyes? If you’re familiar with our methods, you will know that it’s partly about relaxing your eyes. For a non-LASIKed eye with myopia, relaxing the muscles will help the the eye revert to a normal, ie: non-myopic, shape. Therefore, after LASIK, if your eyes were to relax like this, you might wonder if you would become farsighted, unable to focus close-up, because the LASIK has now over-corrected your vision. So do these vision improvement methods we share on this site apply to post-LASIK eyes the same as everyone else? Or will your post-LASIK vision actually get worse with these methods? Your body is an intelligent system. We’re also all different. With all our body parts we have different size ratios, distances, muscle strengths, etc. It isn’t just genetic, but a result of the stresses from activities, not to mention injuries, and somehow with all the unpredictable situations the body learns to get things working well enough to keep you alive and functioning. When you practice movements, it functions better and better. It learns. Scientists already know that myopia is not just determined by eye shape. It’s also a result of corneal curvature (LASIK reshapes the cornea), lens shape, and the distances between the optical components of the eye. For anyone who has normal vision, their body has already coordinated these components, making small adjustments short-term and long-term to muscles and other parts to keep their vision focused for both near and far. It knows what it’s doing. When your body is injured or altered, it eventually figures out what’s going on, more or less, and what adjustments are appropriate. That’s how smart it is. We don’t give our body enough credit for its incredible intelligence. Anyone into holistic healing has come to this realization, that the body is capable of extraordinary healing when it’s given the right conditions. One of the conditions that help healing is a more relaxed mind and body. Your myopia developed to begin with because you were misusing your vision. giving it mixed signals. Your visual system didn’t adjust properly. By creating congruence in your visual system, your muscles relax, and your body has more freedom to find a solution to your vision problems. I have been told that some vision improvement teachers won’t work with LASIK patients because of the possibility of their vision getting worse by practicing the methods. I can imagine that might happen at first, and there would be some resentment towards the teacher for making their vision worse. LASIK is such an invasive procedure that I have to wonder about the details of what would happen. If the visual system were to decide to reshape the cornea as the best option for long-term improvement, would the LASIK flap on the cornea get looser as it’s kind of jostled out of place? I have no idea. But I’m optimistic about it. Long-term, using your eyes better and making your vision more efficient can’t be a bad thing. I imagine there would be a period of confusion as your visual system learns to calibrate itself with the altered structure. But that goes for anyone improving his vision, even without LASIK. And vision improvement can be uncomfortable. People reporting stinging feelings in their eyes and other sensations that suggest some nerves are “waking up” and they become more sensitive to how their eyes feel. This could be even more confusing after LASIK, as you wonder whether the feeling has anything to do with the LASIK flap or dry eyes as a complication of the procedure and if you should be worried. Not to mention other effects like halos, starbursts, etc, that can be transient effects for anyone improving their vision but are also known long-term side effects of LASIK. So with everything weird that happens, you will be anxiously wondering whether it has anything to do with the LASIK operation and if it’s safe to continue. That kind of fear about what you’re doing will ruin the possibility of good results from your vision improvement practice. Your visual system is so sensitive that even that will throw it off. If you’re going to be freaking out at every little thing then honestly this might not be the best thing for you right now. If, however, you’re confident in your capability to see clearly again naturally, and you won’t let anything like some prior laser operation stand in your way, then maybe this is just the right thing for you. I don’t have solid answers to these issues. But I hope this helps you make sense of things. Do what makes sense to you. Follow your intuition. You’ll find a way to make the right choices. In my experience there seem to be 2 types of people coming that have had Lasik treatment. One type – “I have had Lasik and have ‘perfect vision’ now – you couldn’t possibly make it any better” – we do and they are totally surprised. Second type – come because they are finding – after 5, 10 years or so after Lasik – that their near and far vision have started to be a problem and don’t want to wear glasses again. These normally sort out – much to their amazement – after 2 or 3 sessions. Sorted by using light, rest, movement, memory and imagination. I had always thought that having Lasik treatment the refractive error is altered, but it did not alter the way the person ‘looked’ at the world. I wonder now if – for some people – that having gained better vision they may not be straining so much generally. What is not known what will happen to the health of their eyes in the future as the corneas have been made thinner. Have you already tried natural vision improvement methods after LASIK? What is your experience? Share your thoughts below! I know Tiger Woods underwent another LASIK procedure as he said his his vision “started to slip” again. I guess most people that are on here that have had LASIK must have experienced mild vision loss after their surgery, and know wondering why it’s happening and what can be done to fix this problem once and for all. I originally thought about this idea because a friend of mine had LASIK. He hasn’t mentioned anything about his vision getting blurry but it made me wonder, if he learned that it was possible (through my hopefully successful efforts on myself) would he have even more difficulty improving as well. One thing that keeps me motivated is the easy message that something is wrong; blurry eyesight. If that is covered up by any means, you lose a signal from your body. What I’m thinking is that signal or symptom is just one of many things that coincide with blurry eyesight. So if someone gets more and more deeply in tune with their body/mind that’s really the most important thing. Once you start noticing the signals that prove to you that something is wrong, there’s no going back! Good post, David. It surprises me that people will submit to having an invasive procedure like Lasik, or a cataract operation where an artificial lens is surgically implanted in the eye, and then be reluctant to explore something as benign and helpful as relaxation! We’ve gotten really disconnected from the wisdom of our bodies. Hmm, good point! I didn’t even think of how strange that is that people would be scared of trying natural methods after getting such an invasive surgery. I guess it’s huge trust in conventional medicine. Previous Previous post: Are You Discouraged About Vision Improvement?